I’m a little late with my Easter inspiration this year. I was waiting for one of those light-bulb moments of creativity but it seems they just might have all been used up with wedding planing (maybe you have a quota every year). I did have a little strike of an idea the other day when I was perusing my ever-growing magazine stack. 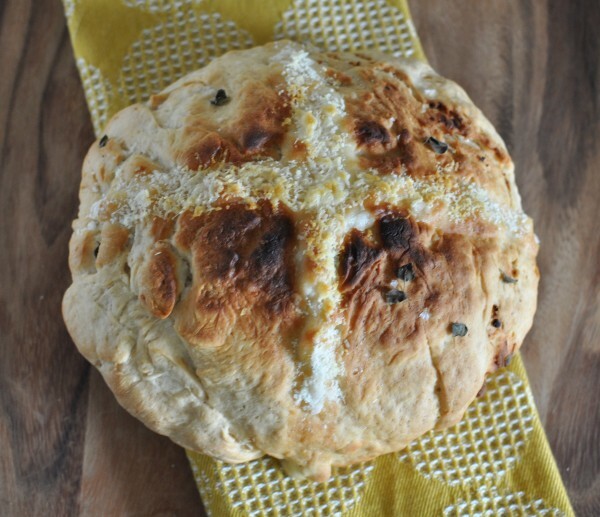 Super food ideas featured a giant hot cross bun in their April issue. I’d already been toying with the idea of mini savoury hot cross buns but a giant one sounded rather genius. 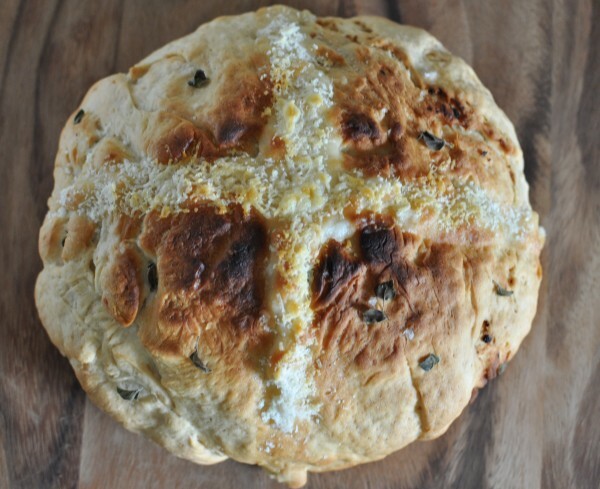 I’ve never seen an Easter loaf at a bakery and we usually just have the good old Vienna or Baguette with our feast so why not a giant savoury hot cross bun? It didn’t take me long to come up the flavour combination. About the only thing growing in my poor neglected garden (it’s taken a backseat to wedding planning) is oregano. My aunt gave me a little pot of it last year and I stuck a few cuttings around the garden. Boy has it grown. It has seriously taken over. If you’re in Brisbane and ever need some feel free to ask! Oregano was a must and what goes with oregano? Parmesan and garlic of course! As you can imagine, this loaf smelled pretty amazing while it was baking. The end result was a wonderful flavour and a light loaf with a dense crumb. I think it would make the perfect addition to an Easter lunch. There are no tricky ingredients and you don’t need any fancy equipment either, although I did take the easy route and use my Mix-master but you don’t have to. Start by mixing up the yeast, sugar and water together and then set them aside for the yeast to do it’s magic. It will take about 10 minutes. I have found that using water at about 105 degrees Fahrenheit seems to be perfect for activating the yeast. 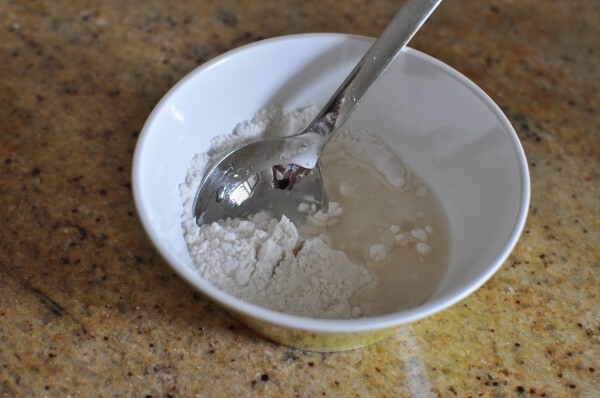 Once the yeast mixture is nice and frothy, sift the flour into a large bowl or the bowl of your electric mixer and add the yeast mixture, salt and oil to it. Knead the dough using the dough hook until it all comes together and then continue to knead it for another few minutes. 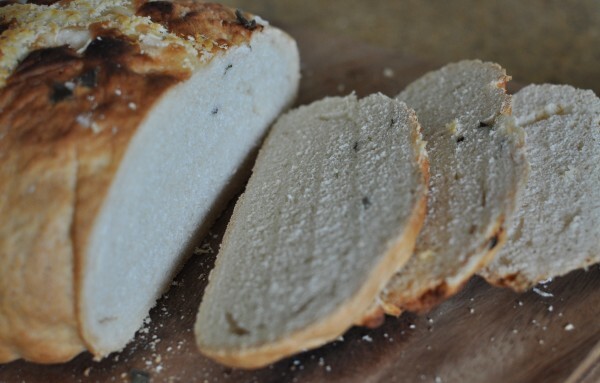 If you’re making the bread by hand, stir all the ingredients together and then tip it out onto a floured surface. Knead the dough by hand for about 10 minutes or until it is nice and smooth and elastic. 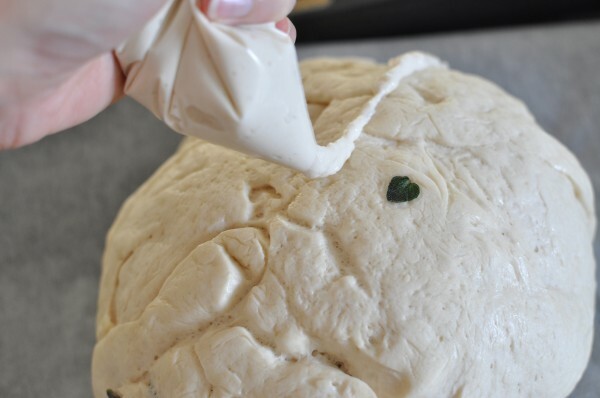 Once the dough all comes together, put it in a well-oiled bowl and cover it with plastic wrap. Set it aside to proof for 1 hour or until it doubles in size. Ok so my dough ball wasn’t all that smooth when I put it aside to rise. The risen result looks a lot like a brain doesn’t it? It’s even divided into the two hemispheres. If you have any angry feelings, bring them all to the surface and let them out with one big punch into the dough. Make sure you let them all out in that punch though because the dough can only take so much. Tip the dough onto a floured surface again and knead it a little bit until it’s smooth then it’s time to add the flavour. 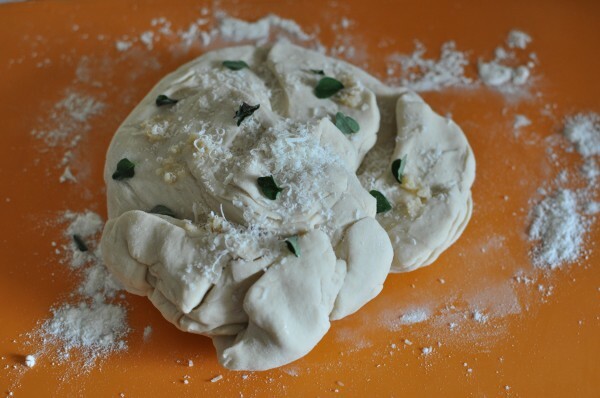 Pat the dough out and sprinkle it with a little of the garlic, oregano and parmesan. Fold a side over to enclose all the fillings and then spread the dough out again and repeat the process. Keep going until you have used all the fillings and then gently knead the dough to bring it all together. 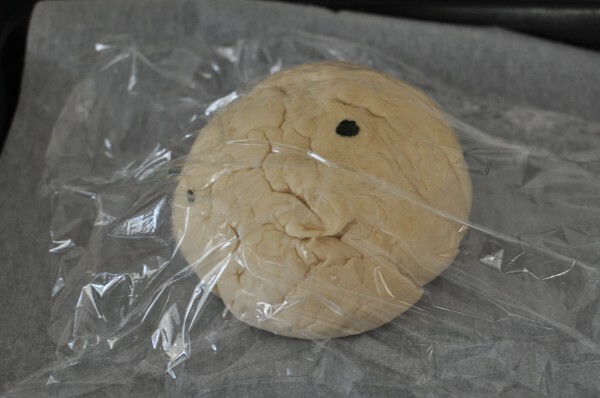 Form it into a ball, place it on a lined or oiled oven tray and cover it lightly with oiled plastic wrap. 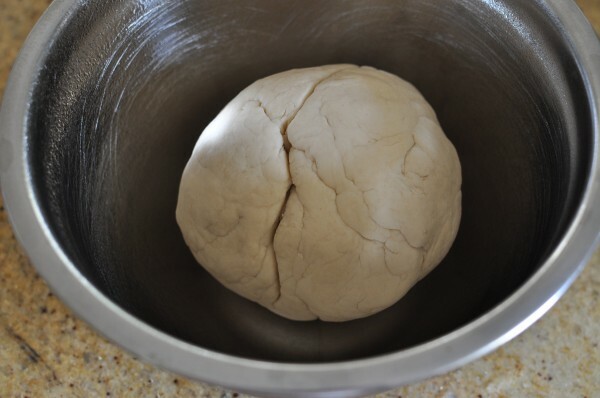 Leave the dough to rise again for about 30 minutes or until it has nearly doubled in size. While the dough is rising, pre-heat the oven to 180C fan-forced and make the mixture for the cross. All you have to do is mix the flour and salt with 2 tablespoons of cold water. You may need to add a little more water to get it to the right consistency for piping. 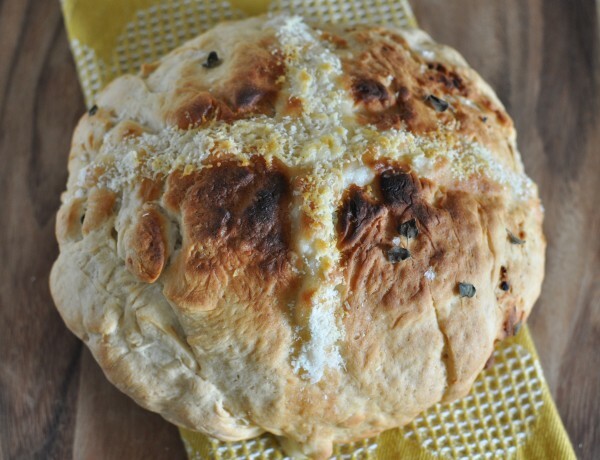 Spoon the mixture into a zip-lock bag and snip off a corner then pip the cross on top of the risen loaf. 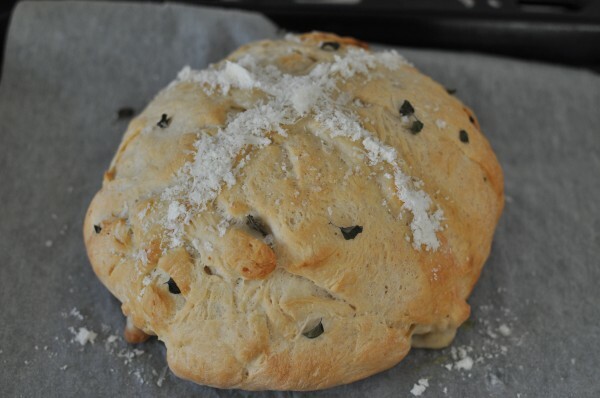 I then gave my loaf a bit of a spray of oil and sprinkled it with sea salt and a few more oregano leaves. Bake it for 30-40 minutes or until it turns golden and sounds hollow when you give it a tap on its bottom. 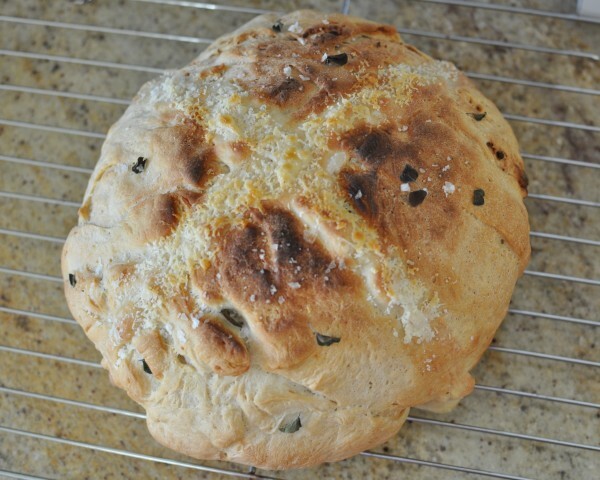 When mine came out of the oven the cross wasn’t very obvious. Never fear, cheese to the rescue. Spread some grated parmesan cheese over the cross and put the loaf under the grill for a minute or two. Oops – got a teeny bit too cooked! Don’t do what I did and start on something else while it’s under the grill. It won’t take long at all but it will burn pretty quickly. I managed to rescue it just in time. I think this loaf would be best served warm with a good smear of butter. Enjoy! What about you? 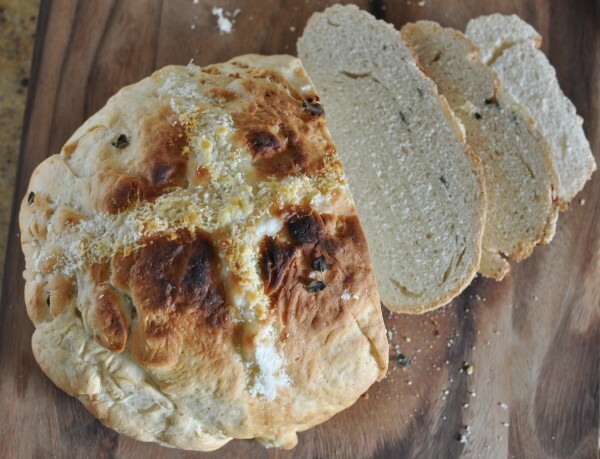 What sort of bread do you usually eat at Easter? 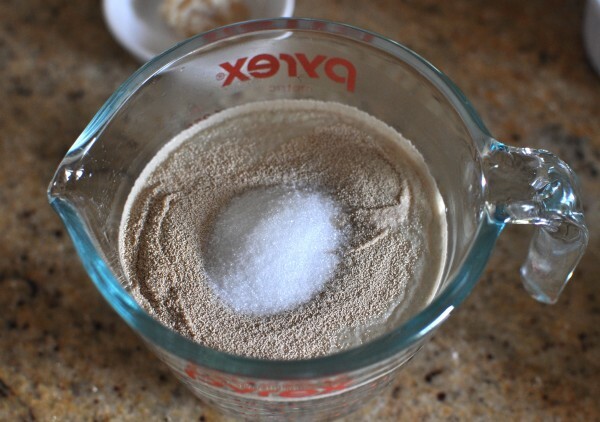 In a large jug, combine the water, sugar and yeast then set them aside for 10 minutes or until the mixture is frothy. 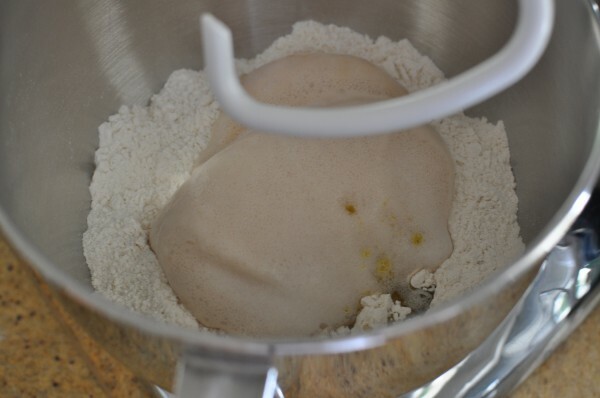 In the bowl of an electric mixer, or another large bowl, sift in the flour. Pour in the yeast mixture then add the salt and oil. Use the dough hook to bring the ingredients all together and then continue to mix until it all comes together in a ball in the center. It will take at least 5 minutes. Alternatively, mix the ingredients together in a bowl and then tip out onto a floured surface and knead until the dough is smooth and elastic. Spray a large bowl with oil and transfer the dough ball into the bowl. Cover it with lightly-oiled plastic wrap and leave it to rise for one hour or until it has doubled in size. 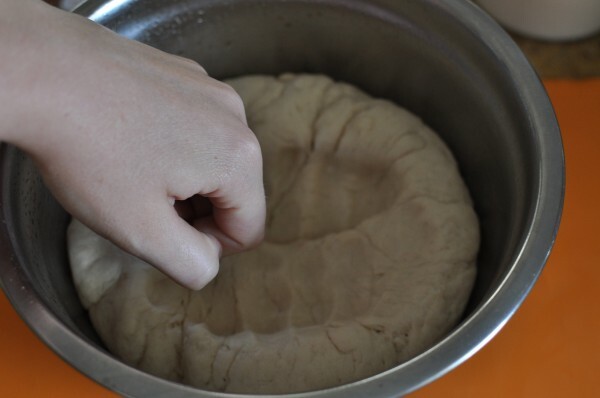 Give the dough a big punch with your fist to deflate it and then tip it out onto a lightly floured surface. 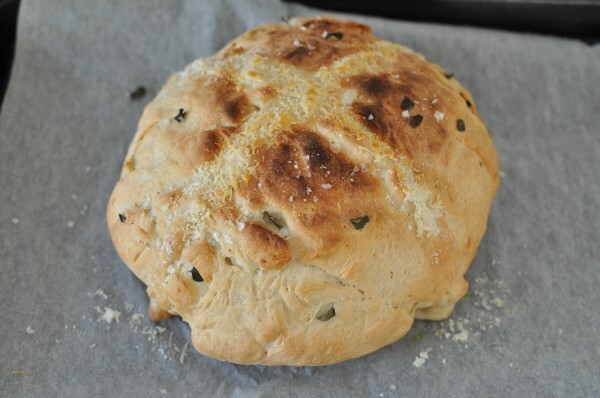 Knead it until it is smooth then carefully fold in the oregano, parmesan and garlic. 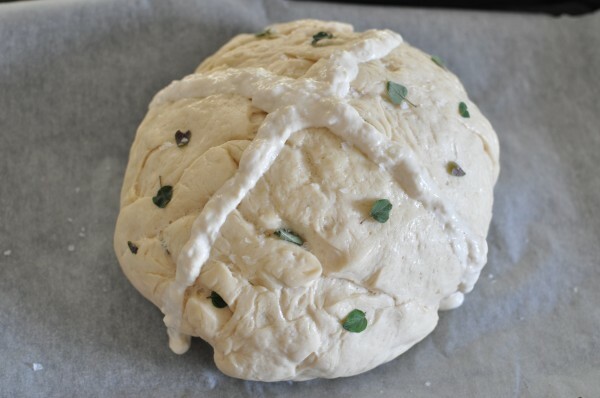 Shape the dough into a ball and place it on a lined oven tray. Cover it in oiled plastic wrap and leave it to rise again for 30 minutes or until is has almost doubled again. While the dough is rising, pre-heat the oven to 180C (356F) fan-forced. 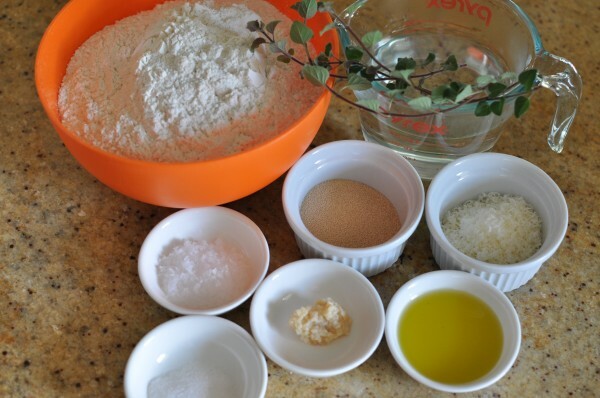 Make the paste for the cross by mixing the flour and salt with 2 tablespoons of cold water. You may need to add a bit more to get it to a pipable consistency. Spoon it into a zip-lock bag and snip off a corner. Pipe a cross onto the top of the bread. 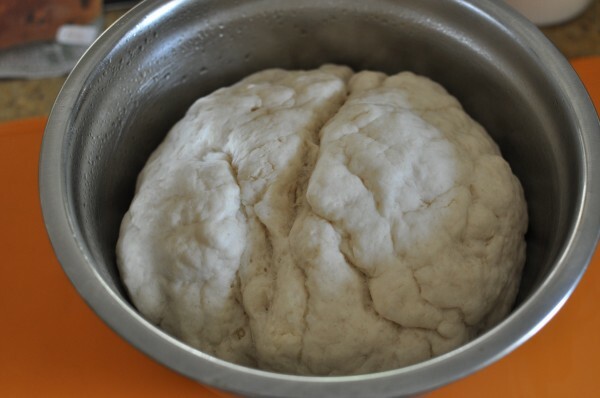 Bake the bread for 35-40 minutes or until it sounds hollow when you tap it on the bottom. To make the cross stand out a bit better, when it comes out of the oven, spread the extra grated parmesan along the cross and put the loaf under the grill for a minute or two. What a fab idea! This would be perfect with some olive oil and salt :) nom!! I’m an olive oil and salt girl too Nic! YUM excellent idea i just might have to attempt it ! What a great idea! And I know what you mean about using up your creative quota-I feel drained this week myself! Oh me too Jennifer, none of the dried fruit for me. I’m going to try out my own version this year (well that’s the plan). I think a pizza might have inspired me!